I create a few kind of skins based on analog hardware. This is for share without compromises. I´m a passionate graphic designer, musician and a Sound Engineer of course. Enjoy these skins, more coming soon... Works on Mac and Win. 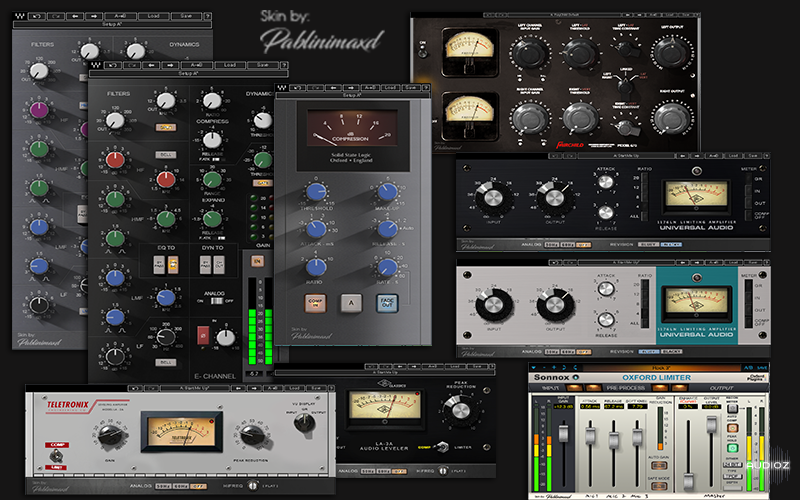 Waves SSL, CLA and Puigchild+Oxford Limiter Skins by Pablinimaxd WiN OSX has been exclusively released on AudioZ by Pablinimaxd who chose to ask not to post mirrors. We are a lot in my head, but it's me the boss. Please, dont write all in caps, unless it's urgent and relevant for all. 2. Rename the PNG_.zip file to PNG_BK.zip in case you want to go back to the old skin. 3. Copy the PNG_.zip to the Waves Content folder and close explorer. 4. Open your DAW of choice and you can now use the skin I made. 1. Open Aplications / Waves / Plug Ins V9 (or V10) / PluginName.bundle / Contents. Right clic and choose "show Package contents"
2. Make a backup copy like PNG_BKP.zip in case you want to go back to the old skin. 4. Open your DAW of choice and you can now use the new skin. Good work, is it at all possible to skin Native Instruments Vintage Compressors? VC76? awesome man thanks a lot - great work ! check these plugins, great design. quote by Pablinimaxd Its a shame they don´t have any crack yet (cause are very expensive and use ilok2 protection. iLok2 has been exploded in December 2015 and Teams don't care about the price. What's up guys? I appreciate all your uploads but is it possible if you could upload the mirror files to sites other than Uploaded and Rapidgator. It would be greatly appreciated. Fantastic, specially the SSL taken from Oxford SSL Native V6, good adaption. Remixer, Producer, DJ and music lover, work on both Mac and PC. Thanks for this beautiful community! Why skins? Why not Bones with DSP algos inside, versions of true emulations and volterra kernel algos in there? Also, could you PLEASE make a Pultec skin for the PuigTec EQP1A?? 1. To install sonnox oxford limiter skin go to your plugins folder and locate de vst, au, rtas or aax plugin then righ click in the plugin and choose "show package contents" and you will see a folder called Resources. Uncompress the Resources.zip skin I share and replace the existent with this new one. Don't usually bother with skins but, just had to try these! These are nice, Pablinimaxd. Unfortunately, I can't use them, but, coming from someone who also does Graphic Design, I have to say that they're well done. Another talented contributor to AudioZ is always welcome. My version is, of course, better ! Thanks anyway, HEHE!